$40.00 Lenin Birth Centennial 1970 commemorative porcelain biscuit bas-relief, unmarked, except for the price in rubles and faint quality control stamp. Probably a Polonnoe product. Excellent condition. $40.00 Patriotic Desktop Porcelain Decoration Commemorating Centenary of Lenin's Birth, 1970. $135.00 Lenin's Birth Centennial 1970 commemorative porcelain tumbler, Gorodnitsa, interesting employment of a retro, almost 1920s Constructivist, decoration throughout. Excellent condition. $125.00 50th Anniversary of the Revolution porcelain flower vase, Kiev, 1967. Excellent condition. $245.00 50th Anniversary of the USSR porcelain pencil holder or vase for smaller flowers, Vozrozhdenie Bronnitsa Factory for Porcelain Wares,1972, features the Soviet national emblem and hand applied gold trim and lettering. $125.00 Fiftieth Anniversary of the Great October Revolution Commemorative Porcelain Vase, Polonnoe, 1967, hefty 9 1/4" tall. Excellent condition. $55.00 Miniature Moscow Olympics flower vase, Leningrad Porcelain Factory (LFZ or Lomonosov), 1980. excellent condition. $180.00 RKKA (Workers and Peasants Red Army) Mess Hall Dinner plate, Dmitrovskaya, 9 1/2" in diameter, 1936-1941. $240.00 Suvorov Military School of MVD Troops Mess Hall Porcelain Dinner Bowl, Pervomaisk, 9 1/4" in diameter, 2 ½" deep, circa 1946 - 1950. Excellent condition. $140.00 Porcelain Dessert Plate Commemorating the 10th Anniversary of the "Reunification" of Ukraine (Soviet annexation of eastern Poland in 1939), by the Korosten Porcelain Factory, 1949. A very uncommon plate in excellent condition. $340.00 Propaganda Porcelain Soup Bowl with Young Pioneers Theme, Korosten Factory, 1922-1934. Rare early piece in very good condition. $70.00 Porcelain Dessert Plate with Soviet Patriotic Motif, Korosten, circa late 1960s- early 70s. An attractive propaganda piece. $95.00 Porcelain Wall Plate "The Union Unbreakable of Free Republics" by the Korosten Porcelain Factory, 1962-1991. Shows a stylized tree bearing leaves in the colors and patterns of the member republics' flags. The text is that of the first words of the national anthem of the USSR. In excellent condition. $50.00 Porcelain Plate in Commemoration of the 40th Anniversary of the October Revolution, Proletariy Porcelain Factory, 1957. Features the Cruiser Avrora firing its guns in Petrograd during the Bolshevik rebellion. A nice plate by a relatively uncommon maker. $125.00 Commemorative Wall Plate of the VSKhV Agricultural Exhibition in Moscow, Budy Factory, mid to late 1950s. A distinctive decorative item of Stalin era. In very good to excellent condition. $80.00 "Great October 60 Years," 4 ½", 1977, porcelain table medal commemorates the simultaneous anniversaries of the 1917 October Revolution and the famous Orshanskiy Fighter Air Regiment. Nice addition to a collection of Soviet veteran's badges and other commemoratives. Excellent condition. $65.00 Vladimir Mayakovskiy Commemorative Porcelain Plate, 9 1/2" diameter, Budy Faience Factory, 1950-1967, features 1920s portrait of the famous Futurist poet. Very good to excellent condition. $80.00 Porcelain wall plate "Female Soviet Athlete", Korosten Porcelain Factory, 1955-1962. In excellent condition. $60.00 "Karlsson-on-the-Roof" Porcelain Wall Plate, Korosten Porcelain Factory, circa 1970s - 80s. The image of a popular cartoon character is instantly recognizable to anyone who grew up in the USSR (most don't know however that there is an unexpected twist to the Karlsson story!) In excellent condition. $50.00 Porcelain Dessert Plate "Little Boy on a Horse", Baranovka Porcelain Factory, 1973-1980s. A favorite motif of Soviet ceramicists was young children playing Civil War era soldiers. 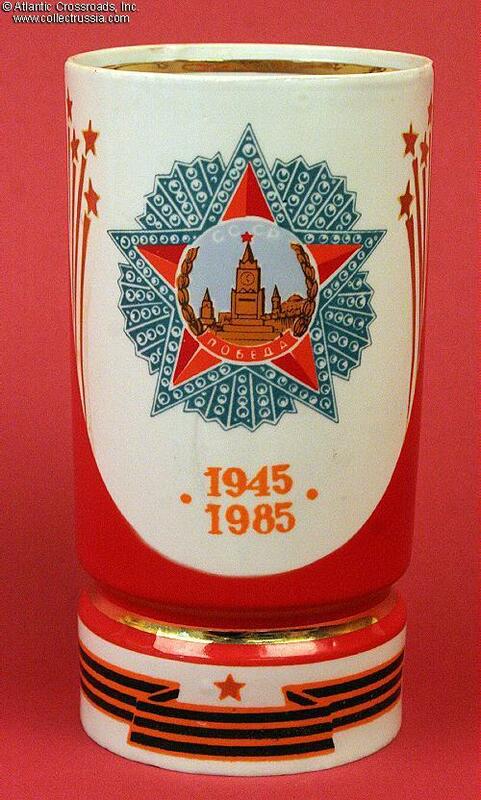 $115.00 Commemorative Mug / Vase for the 40th Anniversary of the Victory over Germany, Baranovka, 1985, huge 7 1/4" size. $120.00 Commemorative Porcelain Mug celebrating the Victory over Germany, Kiev Experimental Ceramic Factory, circa 1985. $55.00 50th Anniversary of the USSR porcelain demitasse cup in cobalt blue and gold, Dovbysh, 1972. Very good to excellent condition. $40.00 Presentation Cup by the Tselinograd Porcelain Factory, dedicated to the 10th Jubilee of the factory, circa 1972. Shows factory logo in gold. $145.00 Commemorative Teapot for the 175th Anniversary of the Baranovka Porcelain Factory, 1977, large 8 1/8" size. $135.00 30th Anniversary of the Victory over Germany Porcelain Teapot, Ukhta, 1975, striking rendition of the Order of Victory and the flags of the Red Army, Air Force, and Navy. Very good to excellent condition.